When Carlsbad logged the game’s first goal in the 17th minute of the second half Tuesday at the Mack Chase Athletic Complex, the change in the Bulldogs’ demeanor was obvious. And unlike in years past, it wasn’t for the worse. Not even close. A few players shouted in frustration. Others kicked the turf angrily. But all had the look of a team that wasn’t going to take it lying down. And so they didn’t. Just over three minutes later, out of a scrum in front of the net, senior Cesar Leyva was able to boot the ball home. The Artesia crowd – enhanced by the presence of a number of youth players for City League Appreciation Night – erupted, as did the ‘Dogs. The celebration was short-lived, however; a tie was good, but it wasn’t enough. As it turned out, it took John Baca just 50 seconds to deliver the shot heard ‘round the county. The sophomore took the pass from Carlos Martinez – who also notched the assist on Leyva’s goal – and hammered it home, setting the home stands off again. With 20 minutes left to play, the boys in orange were by no means out of the woods, and the Cavemen – as expected – took the tempo up a notch in their attempt to reinstate the deadlock. But the Artesia defense was having none of it, guarding the goal ferociously to prevent any clear looks. The few that did make it through were promptly saved by keeper Aaron Natera – who had eight on the night – and as the whistle sounded, the celebration commenced again, this time in earnest. Particularly when coming from behind has not been a strong suit of the ‘Dogs’ in recent years, coming back against a team that topped them 4-1 Aug. 24 on the road was made even sweeter still. 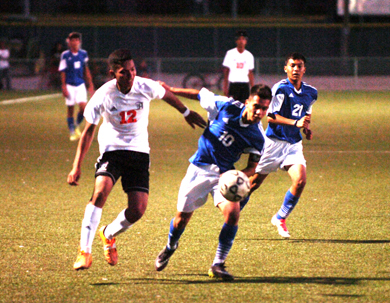 As has become the norm when Artesia and Carlsbad meet, the play over the course of the night – particularly in a defensive battle of a first half – was chippy here and there on the part of the opposition, but the Bulldogs kept their heads and their focus. While Leyva took his turn scoring Tuesday rather than setting up teammates, the senior continues to lead all classifications in New Mexico in assists with 15. That number also puts him in the top 20 in the nation. Stats like that and results like last night’s have the Bulldogs’ momentum at a high, and that should serve the team well as they prepare to hit the road for their final regular-season games of the year Thursday and Tuesday against Portales and Hatch Valley respectively.